Here is a recording of Hymn No. 25 from the “Hymns of Dawn” to aid God’s people in singing and making melody in their hearts unto God. Bride of the Lamb, awake! awake! Why weep for sorrow now? A child of glory, thou. And death itself, shall die. Author — Verses 1 to 5 of the 6 verses of this hymn in the Hymns of Dawn (No. 25) were originally written by Sir Edward Denny (1796-1889) who was an Anglo-Irish baronet and composer. Below we share an excerpt (pages 82 to 88) from STUDY V of Volume 1 of Studies in the Scriptures by Pastor Charles Taze Russell. This is the great mystery of God which has been hidden from all previous ages, and is still hidden from all except a special class—the saints, or consecrated believers. But what is meant by “Christ in you?” We have learned that Jesus was anointed with the holy Spirit (Acts 10:38), and thus we recognize him to be the Christ—the anointed—for the word Christ signifies anointed. And the Apostle John says that the anointing which we (consecrated believers) have received abideth in us. (1 John 2:27) Thus the saints of this Gospel age are an anointed company—anointed to be kings and priests unto God (2 Cor. 1:21; 1 Peter 2:9); and together with [A82] Jesus, their chief and Lord, they constitute Jehovah’s Anointed—the Christ. Jesus, the perfect one, has been highly exalted, and now we present ourselves to him that we may be formed and shaped according to his example, and that we may be built up as a building of God. In an ordinary building there is no chief corner-stone; but in our building there is one chief corner-stone, the “top-stone,” as it is written: “Behold, I lay in Zion a chief corner-stone, elect, precious”—”to whom coming as unto a living stone…ye also as lively [living] stones are built up a spiritual house, a holy priesthood, to offer up *sacrifices acceptable to God by Jesus Christ.” (1 Pet. 2:4-6) And very soon, we trust, the union between Jesus, the “Head,” and “the Church, which is his body,” will be complete. In his letter to the Galatians, Paul opens up the entire mystery, and shows how the Abrahamic covenant is to be fulfilled. He shows that the Law given to Israel did not interfere with the original covenant (Gal. 3:15-18), and that the seed of Abraham which is to bless all nations is Christ. (Verse 16) Then, carrying out the idea already alluded to, [A85] that the Christ includes all anointed of the Spirit, he says: “For as many of you as have been baptized into Christ have put on Christ;…and if ye be Christ’s then are YE [together with Jesus] Abraham’s seed, and heirs, according to the promise” made to Abraham. (Verses 27,29) Following up the same line of reasoning, he shows (Gal. 4) that Abraham was a type of Jehovah, Sarah a type of the covenant or promise, and Isaac a type of Christ (head and body); and then adds, “We, brethren, as Isaac was, are the children of promise.” (Verse 28) Thus the plan of God was hidden in types until the Gospel age began the development of the Christ. Not only is the plan of God, and the Christ which is the very embodiment of that plan, a great mystery to the world, but the peculiar course in which this little flock is called to walk marks its members as “peculiar people.” It was a mystery to the world that a person of so much ability as Jesus of Nazareth should spend his time and talent as he did, whereas, if he had turned his attention to politics, law, merchandise or popular religion, he might have become great and respected. In the opinion of men he foolishly [A86] wasted his life, and they said, “He hath a devil and is mad.” His life and teachings were mysteries to them. They could not understand him. The apostles and their companions were likewise mysteries in the world, in leaving their business prospects, etc., to preach forgiveness of sins through the death of the despised and crucified Jesus. Paul forsook a high station and social influence to labor with his hands, and to preach Christ, and the invisible crown for all believers who should walk in his footsteps. This was so mysterious that some said, “Paul, thou art beside thyself: much learning doth make thee mad.” And all who so follow in the Master’s footsteps are, like Paul, counted fools for Christ’s sake. Now, to all except those begotten to a new mind, by receiving “the mind of Christ,” the promises which we believe, and the hopes which we cherish, seem visionary, and too improbable to be received or acted upon. In the age to come, when God shall “pour out his spirit upon all flesh,” as during the present age he pours it upon his “servants and handmaids,” then indeed all will understand and appreciate the promises now being grasped by the “little flock”; [A87] and they will rejoice in the obedience and exaltation of the Church, saying, “Let us be glad, and rejoice, and give honor to God, for the marriage of the Lamb is come, and his wife hath made herself ready.” (Rev. 19:7) They will rejoice in the glorification of the Church, through which blessings will then be flowing to them; and while they will realize that the “exceeding great and precious promises” inherited by the Anointed (head and body) are not for them, but are fulfilled upon us, they will be blessed by the lesson illustrated in the Church; and while they run for the blessings then held out to them, they will profit by the example of the Church, and glorify God on her behalf. But this knowledge will not bring covetousness; for under the new order of things their calling to perfect human nature will fully satisfy them, and will seem more desirable to them than a change of nature. Then the “mystery” will have ended; for the world will have come to see that it was the spirit of God in Christ, and the spirit of Christ in us—God manifested in the flesh—which they had hitherto misunderstood. Then they will see that we were not mad, nor fools; but that we chose the better part when we ran for the riches, honors and crown, unseen by them, but eternal. Section 13 – Midnight by Br. David Rice. The Stream of Time, page 75-78. I Am My Beloved’s, and My Beloved Is Mine. The Dawn Magazine, Sept. 1989, in the Christian Life and Doctrine section. Christ’s Parousia (Second Presence) In 1874. BIBLE Students DAILY. SONG OF SOLOMON 2:1, 2, 16 — The Rose of Sharon & the Lily of the Valley. BIBLE Students DAILY. NEHEMIAH 8:10 — The Joy of the Lord Is Your Strength. BIBLE Students DAILY. Our Beliefs — What Does the Bible Teach Us? BIBLE Students DAILY. Bible Students’ Links and Bible Study Resources. BIBLE Students DAILY. Here is a recording of Hymn No. 24 from the “Hymns of Dawn” to aid God’s people in singing and making melody in their hearts unto God. Author — Charles Wesley (1707-1788). In the Hymns of Dawn, the original third verse is omitted, while the words of the last two verses (verses 4 and 5) have been changed from the original. Charles Wesley was an English leader of the Methodist movement, most widely known for writing no less than 6,500 hymns. He was the youngest son and 18th child of Anglican cleric and poet Samuel Wesley and his wife Susanna Wesley, and the younger brother of Methodist founder John Wesley. Composer — Lewis Edson (1748 – 1820) composed this tune “LENOX” in 1782. When Does the Year of Jubilee Begin? The Jubilee was a time of release. There are four points from the Jubilees to a period of release. (1) 1874 — the beginning of the Times of Restoration. This was the year when Lord Beaconsfield was elected Prime Minister of England, from which position he was able to subsequently effect a restoration of rights to the Jewish people to own land in Palestine again. (2) 1878 — Land is opened to Israel again as a result of the Berlin Congress of Nations. “The first signs of Israel’s regathering appeared in 1878. The Berlin Congress of Nations assembled to resolve the Russo-Turkish War of the previous year, and among their agreements was a provision extending equal treatment of law to all the people of the Ottoman Empire. Notably, this included the Jewish people, who took advantage of the opportunity to found the first new [Hebrew] settlement of modern times in the land of Israel — Petah Tikvah” (“The Stream of Time,” by Br. David Rice, page 21). (3) 1948 — Nationhood was restored to Israel. (4) The Millennium — Life will be restored to mankind. All of these are relevant. There is a time pointer to each one. (A) Adam to 1874 — 7 x the whole cycle of 17 Jubilees. That is, 7 x 833 = 5831 years, from 3958 bc to 1874 ad. (B) 50 Jubilees (of 49 years each) is 2450 years, followed by the 50th jubilee, year number 2451. Taken from the last Jubilee of Israel (Ezekiel 40:1), that brings us to the year of autumn 1878 — during that time the right to buy and own land in Israel was restored to the Jewish people, and the first Jewish colony was begun. For Pentecost we count 50 days, for jubilee we count 50 years, so for the antitype we count 50 jubilees — which brings us to the fulfillment, marked by the year 1878. (C) 2520 years (national punishment), from Ezekiel 40:1 brings us to the year autumn 1947 to autumn 1948 — during that time Israel became an independent nation again. (D) Ezekiel 40:1 (Israel’s last Jubilee) was the time of giving of the vision of the Kingdom. Ezekiel 46:1 tells us the gates permitting man to access God would be opened on the sabbath day — 2043. That will be a time of restoring life. Four dimensions — all correct. For the interested Reader, please consider reading further about the Jubilees in Section 3 (pages 15-20) and Section 4 (pages 21-24) of “The Stream of Time” by Br. David Rice. Br. David Rice (www.2043ad.com) — Content and editing. Br. Frank Shallieu (www.revelation-research.org) — referenced information. Israel Marks Tenth Anniversary, The Herald of Christ’s Kingdom Bi-monthly Magazine, June 1958, page 95. Israel at Sixty, The Herald of Christ’s Kingdom Magazine, July-August 2008 issue. Notes on the Song of Solomon (1988 and 1994 Studies) by Br. Frank Shallieu. ISRAEL — No Longer Dry Bones! 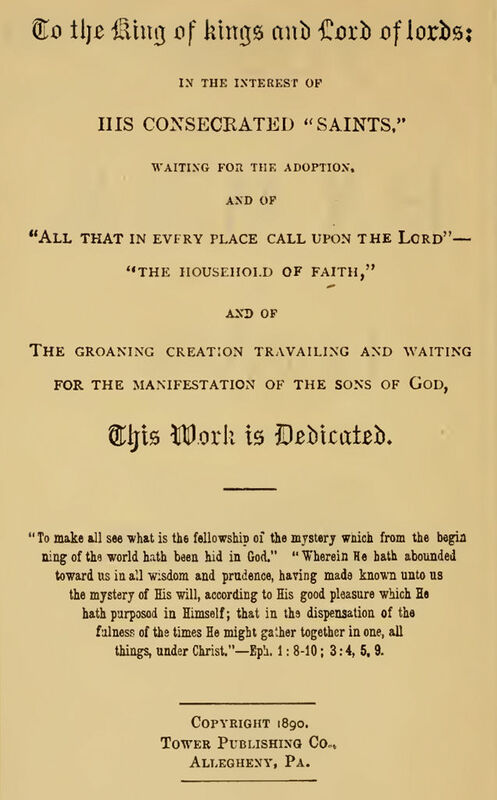 Debtors To His Marvelous Grace, by J.J. Blackburn. The Herald of Christ’s Kingdom Magazine, July/August 1986. The Foreshadowing of Grace, by F.A. Essler. The Herald of Christ’s Kingdom Magazine, January/February 1986.